Stay safe and sanitary while washing dirty dishes by wearing this Choice 40" x 25" brown vinyl dishwashing apron! 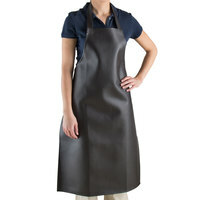 This quality apron features a heavyweight, water-resistant PVC vinyl construction and protective full-length design. It's easy to clean with the classic look of leather, yet it features a soft cotton knit backing for comfort. Should any food or drink splash onto the apron, simply wipe clean. The rich brown color offers a professional look in any kitchen, while a tie-back design ensures one size fits most. I use it to wash the dishes and when cutting up meat so you don’t get dirty. It is easy to clean and very comfortable. This is a nice water proof apron. We have a dish washer that is like a big spa the water is constantly moving and to get the dishes clean. It keeps our dishwasher dry while he is using it. Heavy duty apron that gets use daily and holds up nicely. We ordered extra for our back of house staff and it protects them well. i like this vinyl dishwashing apron. i beat heck out of it. i use it all time, cooking, car repair, and for dishwashing. it last for a long time. i will buy same one gives out. We keep several of these heavy duty aprons for our dishwashers. They definitely help keep them dry, and look a little nicer than a cheap yellow vinyl apron. The tie strings, however, are cheaply attached and have fallen off every apron we've had. The apron itself is a great product that withstands a lot of usage. Wish they could figure out a way to secure the tie strings better! The dishwasher was begging for one of these, I cant speak to how well this product works in use, but i can tell you my dishwasher was very happy i got him something. Hopefully he sticks around. This aprons are durable and thick. I thought my staff could use a simple cloth apron for washing dishes, but this is what you really need to keep your clothes dry!! Mediocre, but effective. The apron itself works fine. It's just the waist strings always seem to come un-attached. On the other hand, they're pretty cheap, so there's that. I just wish they were more long-lasting and I didn't have to replace it every 6 months. we like this apron for our dishwasher to wear. it is priced right and holds up well. this is our second time purchasing this apron. love that its super long and very versatile. it does get me wet when am washing dishes or cleaning the racks. gets dry super quick. worked well till the side strap broke,kept me dry when washing dishes at work. strap is adjustable for length,heavy vinyl material,affordable priced,may purchase again in future. This is a necessity for dishwashers! My employees love them no matter who it is washing the dishes. It's sturdy and adjustable and keeps clothes clean and dry. Bought these for my dishwashers and they couldn’t be happier! Keeps the over spray from getting on your chest. A must have for washing dishes. This apron was a genius buy for us. Our dishwashers use to wear two or three cloth aprons at a time to keep dry. This vinyl apron keeps them dry and has lasted for quite a while now! It was a great buy for us. We use these aprons in our dish washing area and they work great. They are comfortable and the vinyl seems to hold up pretty well. There are aprons out there that the vinyl begins to crack and let water through after a while but these haven't done that yet and its been about 6 months of consistent use. The only issue i have is the straps aren't secured terribly well. Some of our have lost a strap at the seam where it is sewn into the apron. I love my Brown vinyl dishwashing apron It is the perfect size to keep me from getting wet while washing my dishes at my restaurant. We serve lunch at the senior center using real plates and flatware. Our volunteers come in during their own lunch break to help with the lunch program including washing the dishes. They use these aprons to keep their work clothes dry and clean. This apron worked perfectly and the stitch for the strings is sown in well. It's the perfect length for a person who is 5'10 meeting right at the middle of the thighs. This apron was great for keeping our dishwashers dry, however slightly too long for our shorter employees. We had to replace after about a year. We use this apron in our commercial kitchen for the person washing the dishes. It keeps them dry without hindering their movements. Good product! We are happy with the results. This dishwashing apron will keep you dry even in the most stubborn of dish washing situations. It's also ideal for butchering, if you happen to need that too! It's a bit ugly but it does the job - keeps you dry during a long dishwashing session. Before we had these I would walk out soaking wet! I needed a no frills apron for cheap. This was just what I needed. It comes in handy for household chores. It prevents my clothes from getting bleach and other chemicals on them. Very durable and water proof apron that serves it's purpose very well. Very good quality even with the abuse heaped upon it by dish staff! Long length keeps crew dry! I'm a huge slob in the kitchen whether I'm at the dish station or behind the line. I somehow manage to get covered in food just standing around some days. Love this apron and would have given it five stars -- it's comfy, looks sharp and keeps me clean and dry -- but the stitching on the vinyl drawstring needed reinforcing. Attractive, heavy and well made! I like them! And the price is WAYYYYY better than the local stores. Stitching and everything seem GOOD for the price. This apron is awesome! Now I don't have to be soaking wet every time I do the dishes. I'm a big girl and it fits with room to spare for tying, which is usually a struggle to do with other aprons. Useful, stylish and cheap, these aprons are handy to have around the kitchen or at a party. Just put some clothes on underneath. Keeps food off of said clothes. These are great, but only for about 2 months. I've purchased multiple ones and have the same issue with them all. The straps rip off the side. It's an easy fix so why don't they do it!? Great to have handy when dealing with some harsh cleaning chemicals. Keeps my clothes underneath clean from any stains. Not so heavy which is a plus. This apron is far sturdier than the San Jamar Clear Vinyl Dishwashing Apron however the straps are not sown on very well....both sides ripped off in the first use. We solved this by riveting them to the apron and now it works great but strange for such thick material to come off so easily. Bought a couple of these for our heavy duty dish washing. They do the job well keeping everyone dry. Some complaints that they are hot to wear but theyrevent getting clothes wet. This is very nice. A lot of times these dish aprons are cheesy and junky. But I like this one more than any other I have bought. It is not over sized. I am 6 foot and it fits nice. This is a really good buy. Perfect for the dishwashers so they do not end up soaked by the end of the night. They do wear out and get holes after several months. Works Great for what we need. Cheaper then anywhere else we priced it. Also Webstraunt's customer service can never be beat. They are on top of any issue you may have. Good quality for our dishwashers to keep themselves dry. Will work with most body types and seems durable enough if handled properly and you can get some time out of it. The quality is not really. One apron we can use about 4 to 5 weeks. However, it is cheap if compare to other vinyl apron. I would recommend this. We were tired of feeling soaking wet after dishwashing sessions. This apron is heavy duty and keeps you dry while protecting clothing from water and stains. Although these aprons are a little heavy, they really are the best, they last a long time and will save money as you re-use them. Water resistant, and moderately heavy vinyl, but disappointed in the durability. The lightweight nylon strings break very easily where they are sewn into the vinyl. We purchased this apron not too long ago for our restaurant, we used it on daily basis. Its great, we had other aprons in the past but they always ended up ripping and didnt last too long. This one is awesome. The apron works well for keeping water off of dishwashers, and is very sturdily made. It is unfortunately a bit heavy to wear, which can make it awkward after long uses. This has held up incredibly well! My dishwasher works hard, and this is the perfect compliment to his hard work. We have been gracious to have this apron over the last several months. very good for dishwasher and heavy duty work on dirty a lot of plate and more I very recommend for this product. You will love it. Best purchase to date! I wear this apron everyday. The material is heavy duty and 100% water resistant. Would pair this with some sponges and dish washing gloves. Great quality! Years of experience with manual, commercial washing has taught me that a good, heavy duty Dishwashing Apron is a necessity! This one does not disappoint! Its a heavy duty vinyl which I'm glad it's not a cheap 'throw away' version. I love that its full body to protect from accidental spilling and gives plenty of arm movement too. I like that the strings are long enough to wrap around and tie in the front for easy use. The ONLY reason for 4 stars is that I wish the neck strap was adjustable since we only have one of these and multiple people of different sizes use it. this is a great apron. It is the perfect length for all of our dishwashers. It is also a very thick material, yet soft enough to not crack. Perfect for hanging in the scullery and slip on before doing the piles of dirty pots and pans. Just slip on, wash away and then take off and hang up as you go back to your other duties. There are pros and cons to this product. It keeps you dry and also kind of warm. The neck strap I don't think will last long as it is thin and with so many times of taking it on and off. The stomach strap is thing and hard to tie and untie. The apron feels thick and worked well keeping my staff dry when washing dishes but the neck strap is not adjustable and broke after a few months of heavy use. I'm not too sure about this apron. The material feels nice and repels water well enough, but I have the say the straps are atrocious. They're thin and hard to tie and untie. Seem to be the worst part of the apron. I don't like the material they're made out of. We really like this aprons we used them to do dishes, really easy to clean the only thing is fabric we have to replace them really often but they're cheap so no complains!! These work great to keep you dry when washing dishes! They are a good value. The only drawback in my opinion is they are longer than I realized, but I can deal with that if it means keeping my clothes dry! Great Item, great price and good quality I have been shopping with Wecstaurantstore for a long time and the best price you will found ever. Bought 6 of these Aprons, they've held up relatively well, in use daily for a year. On 2 of them the neck strap came loose after a while but not a big issue as we sewed it back on. The vinyl front has held up well and still looks relatively new. These would probably be ok for occasional use but, with daily use they take about 3 weeks before the plastic on the front start splitting. Once that happens, you are gonna have a soaking wet shirt so you might as well take it off anyway. I made my 15 year old dishwashers day when this showed up in the mail. The apron is made for heavy-duty dish washing, light weight and will fit any body. The other one uses an old apron from a hair salon that says "The matrix". I use these when preparing or serving food in my food trailer. They are great for keeping my clothing clean and presentable. Good value and plenty sturdy. The apron is thick enough to repel all water. It works great at keeping you dry and clean. I'm 5'2" so it's a bit long on me. It practically hits my ankles but I can't complain since it does the job. Great, sturdy apron! It is large enough to cover the entire front and sides of me and comes down pretty far- to my knees. When using the sprayer in the sink, this is really helpful. Very poor quality. The strings or straps ripped off after about a week of use. The quality of the apron itself is okay but not very comfortable. Vinyl apron is easily wiped clean . Water never leakes through surface. Also the easy tie option make it a great fit most of our workers. These aprons are very heavy duty and stop the water from drenching our dishwasher. They are also very helpful with keeping our uniforms from becoming bleached. This thing is super thick! My dishwashers come in with clean clothes, and then when they clock out and take this off, their clothes are still clean. This apron was delivered quickly, it is a very quality, durable, vinyl material, my employees seem to really appreciate the added thick quality material. Happy with this product. This is a great product that has saved countless hours of soaking jackets and shirts to try to remove those pesky residual black aluminum and carbonized stains when deep cleaning equipment or cleaning heavy grease buildup. Works very well at keeping my employees dry. However it is too long for some of my employees. It goes all the way to the ground, so it rests on their shoes and will drip water into their shoes. A very good apron and it really protects your clothes from getting wet, and the good thing about it is it cleans up very easily. Was impressed by the apron. Not only does it protect from water spills, but it also is a very good looking apron. It even looks as if it's leather. Bottom line is that it is great for the dishwashing area, and is very easy to be cleaned after getting dirty. Great most of body coverage area, heavy duty material does not rip or tear, easily cleaned and dried without washing. A tool for doing dishes. Our dish washers love these aprons, they are very sturdy and keep them nice and dry, Nice fit would highly recommend this apron great value! We have been using this apron for about 3 months now. My dishwasher has thanked me for buying it more than once. We have not had any problems with the ties coming off the apron. It worked great for a while but after time broke down and created holes in the apron. I wish it was a little more durable. Our dishwashers have been very happy with this product. It allows the dishwasher to work in comfort and not get soaking wet while caring wet glass racks or spray down mats. They are easy to clean and constructed well. This apron is a great buy! The price is great. This apron will keep you dry and is lightweight so it will not hold you back when you are in a rush. Purchased two of these with high hopes, sadly, they let us down. Within 2 weeks the stitching on both fell apart at the neck AND the waist strings. They don't do any good if you can't wear them. However, the material is high quality and if it weren't for the sub-par stitch work, they would be a great product at a great price! Now, I'm having to buy the yellow set. Fingers crossed. Very good apron. Keep you guys clean and dry. It's something that every dishwasher has to wear expecially in the rush. I'm gonna buy again when it will be damaged..and I think in long time because is very well done and resistant! The Brown Vinyl Dishwashing Apron keeps our dish washers and Oyster Shuckers dry and clean. It is a great buy and very multifunctional for any busy restaurant! Awesome product. Does not rip at all. Easy to rinse. Not heavy at all. would highly recommend. Can basically fit anyone. Does not hold debris. really great dish apron, a must have if you have a commercial sprayer and 3 compartment sink. we always use one at the cafe. keeps us dry! I have had this apron for quite a while and it is still going strong. Very durable! It works just like it should and keeps the water off your shirt when you are doing dishes. Great buy! This apron is perfect to keep by the dish washing sink to protect my clothes and my employee's clothing while we're washing the dishes. Well made, couldn't have asked for better! The Brown Vinyl Dishwashing Apron is a great quality apron. The size is just right and I have no doubt that it will last a long time. Heavy Duty apron that defends against everything! it is really strong and durable but might even be TOO heavy because its so strong. Great price. These were a lot heavier than I thought they would be, but it keeps our dish washers from getting wet. It does the job very well. What can I say a good quality apron at a good price. I use these at my ice cream business with no issues so far. These are the best aprons you can buy for washing dishes! Repels water with ease and keeps chef coats and pants clean! Good for deep cleaning!! !